Europe on a river cruise. Hands up, everyone who’s dreamed of a getaway like this. My husband and I decided to splurge for our 30th anniversary, and the Grand European Tour from Viking River Cruises exceeded all expectations. Fifteen days on the ship from Amsterdam to Budapest, with daily excursions, plus a three-day extension in Prague at the end. I loved being on the deck watching the scenery slide by. My favourite stop was the charming town of Miltenberg in Germany, and Budapest at night is the most beautiful city I’ve ever seen. Conversations with our tour guides and with the crew on Viking longship Alsvin gave me a reality check about conditions in some of Europe’s former communist countries. Why had I assumed democracy was some kind of magic remedy that would make things better? Democracy and freedom are fine things, but like everything else, they have learning curves and weaknesses. New political leaders need time to learn how to govern well (sadly, the corrupt ones seem to catch on faster). With no restriction on travel or occupation, those looking for a better life may forsake the fields for the factories, or their homelands for emigration. It surprised me to hear that some people long for the “good old days” of communist rule, when “nobody had much, but everyone had something.” Others are thriving, and building a bright future. These scattered tidbits of information were a minor part of our tour, but in the midst of sightseeing, sampling fine food and learning history, they carved a sense of hopelessness in me. What could I say to someone in this position? “Jesus loves you?” He does, but the words alone don’t sound like much. And they’re hard to trot out in a two-minute conversation with a stranger. Normal people wouldn’t be affected this way, but although I tried not to dwell on it, my heart-heaviness grew. 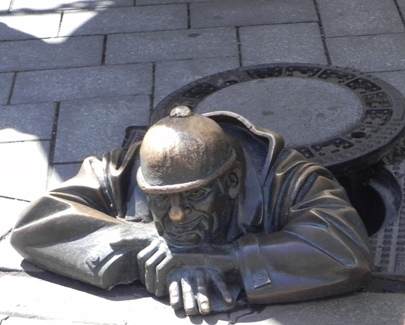 Our bus tour through the city of Bratislava discouraged me. On the one hand, we saw a bridge that’s an engineering marvel, as well as opulent villas where international ambassadors live and hold court. We saw a historic castle, still in use for diplomatic meetings. 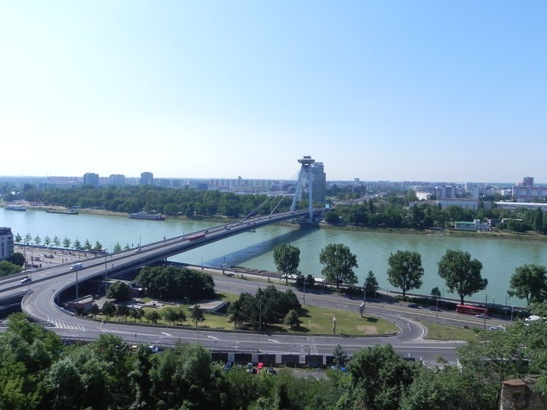 Slovakia’s capital city is poised for growth. On the other hand, we saw smoke from clusters of factories. We heard about the thin walls in the grey ranks of apartment complexes. The contrast between rich-and-showy and trying-to-survive hurt me. 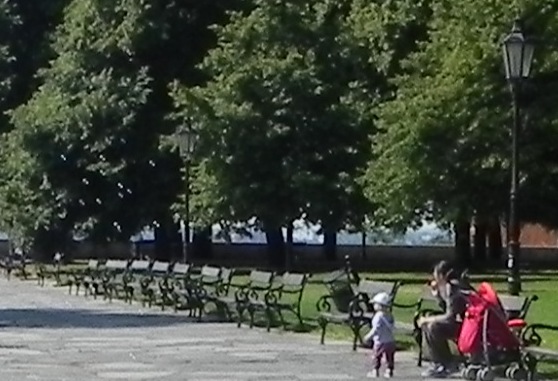 The bus let us out to explore the grounds of Bratislava Castle. My husband and I wandered, taking photos and absorbing the atmosphere, but I couldn’t shake the sadness inside. Talking with God wasn’t helping. Until I turned and saw His gift. On a park bench, a mother. Blowing bubbles for her child. Something in the simple act spoke hope to me. God is still God, and He’s still present and at work. Looking back now at our photos, I see a beautiful, modern city with green space, cradling a picturesque, cobblestoned historic centre. The older part has quaint buildings, brass statues, and of special delight to my husband and me, fine chocolate and artisanal honey. How much would I have missed if I only remembered this city through my sad impressions? Funnier? That’s a big part of the message I brought home from Write Canada: pray to see and hear what God sees and hears. More about that in a future post. 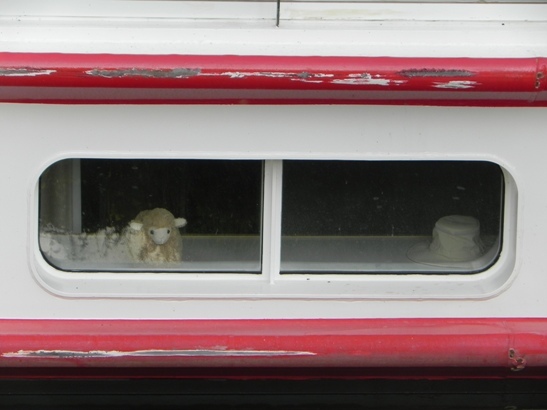 Oh—lest you’re wondering, Eowyn the travel sheep (or “porta-sheep”) came too. Acton the adventure sheep would have needed his own seat on the plane. Curious about the scrapes in the paint on such a new ship? We passed through a lot of locks, sometimes with bare inches’ clearance on each side. We had a skilled crew, but wave action will jostle a boat while the water’s rising. This entry was posted in Christian Living and tagged Bratislava, democracy, discouragement, Eowyn the Sheep, hope, perspective, sheep, vacation, Viking River Cruises on July 25, 2014 by Janet Sketchley. Thanks for sharing your views and the scenery. I’ve been to the communist countries before the iron curtain demolished. It was depressing for me as a Westerner coming from affluence. It shocked me to the core and I had a hard time recovering from the culture shock even months later. River cruise? How exciting! Lot of experiences to think and write about. Love the photos. I was surprised by the level of culture shock I experienced, Pirkko. I can only imagine how strong it was for you back then. Thanks for stopping by! That was so perceptive, Janet. Sometimes, God uses the little things, when the heavier issues are just too hard to sort through. God is still in control and I am sure people sensed God’s love for you, even in those two minute conversations. Sounds like you had an amazing time, complete with challenging questions to ponder. Yes, God sees all and knows the victories and sufferings of his creation. And…I will continue to dream of river cruises and castles. Perhaps there is a chance for that one day. Thanks for sharing. I’m glad God splashes blessings into the hard spots. And if the river cruise chance comes up, take it! Viking even does one into Russia, although I don’t know if it touches the area from your novels.